Thanks, Merci, Danke there are many ways you can say thank you but this is certainly the yummiest! 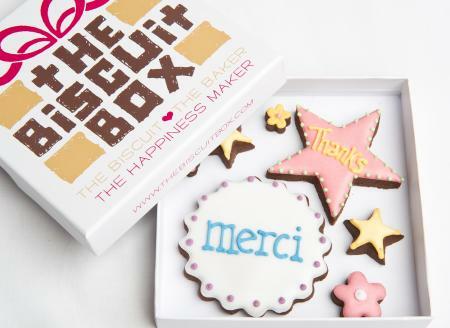 This Thank You tin lets someone know how grateful you are, packed with hand iced biscuits they will be thanking you after receiving this! This tin contains approximately 26 hand iced biscuits of various shapes and sizes all displayed over 3 layers and presented in our Thank You Tin. 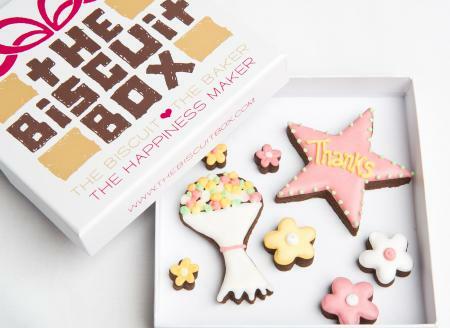 This colourful box of yummy biscuits is bursting with beautifully hand iced flowers. 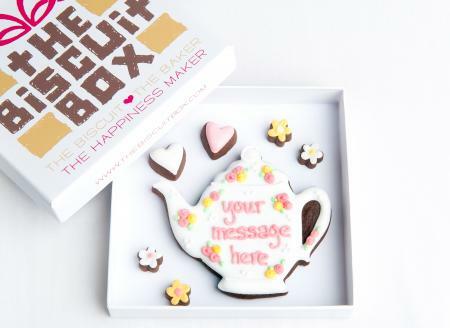 Personalise the central biscuit with a message of your choice. This biscuit box contains approximately 17 hand iced biscuits in various shapes and sizes, displayed in one layer in our branded box. 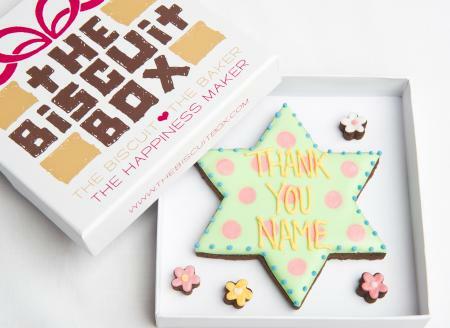 Thank someone with this beautiful hand iced star biscuit, add their name to make it really unique. This biscuit card contains approximately 5 biscuits of various shapes and sizes all displayed over one layer and presented in our biscuit card box. Thank someone in many ways with this cute biscuit card. 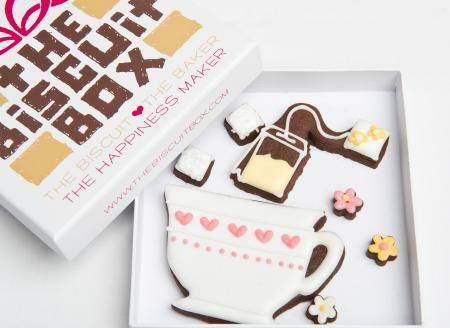 Hand iced on our yummy chocolate biscuit it will certainly bring a smile to their face! This biscuit card contains approximately 7 biscuits of various sizes displayed over one layer and presented in our branded biscuit card box. 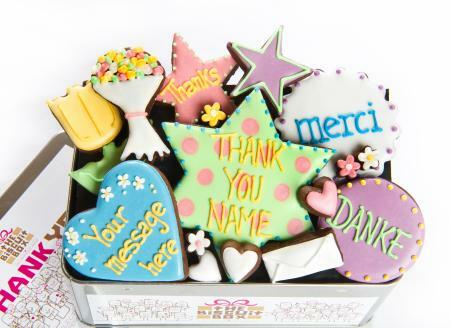 Give a biscuit bunch of flowers to say Thank You with this yummy biscuit card. 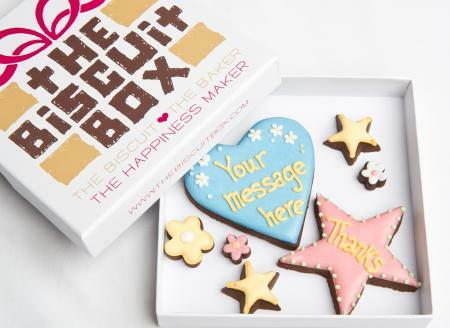 Say 'Thanks' with this biscuit card, the tasty alternative to a regular card. 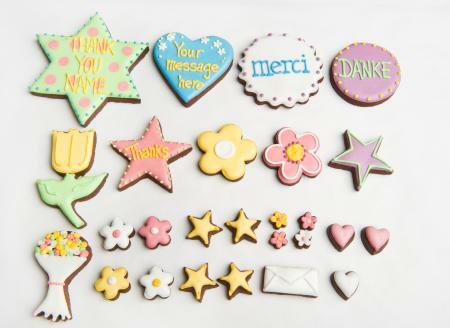 Brighten up someone's day with this beautifully iced collection of flower biscuits. All displayed over one layer and presented in our branded biscuit card box it makes a great gift. This biscuit card contains approximately 8 biscuits.